Learn about the history of biotechnology, life science, and the pharmaceuticals in South Dakota. The following includes select facts from life science history, both global and South Dakota state specific, that help explain the origins of the state's life science industry. Please note that these facts are part of a much larger state-specific history database that will be launched in the near future. In the meantime, we encourage you to learn about the scientists behind the discoveries, the entrepreneurs, philanthropists, political leaders, and significant events, institutions and companies that are the foundation of the life science industry in the state of South Dakota. 1862 -- University of South Dakota was founded. The University of South Dakota was founded by the Dakota Territorial Legislature in Vermillion in 1862, making it the oldest university in South Dakota. Today, the public university enrolls over 8,000 students and is home to the state's only medical school. The university also operates several research centers and institutes including the Cardivascular Research Institute, the Center for Rural Health Improvement, and the Disaster Mental Health Institute. 1881 -- Dakota Agricultural College (South Dakota State University) was founded. South Dakota State University was founded in Brookings in 1881 as the Dakota Agricultural College, a land-grant university. Research has been a vital part of SDSU since 1887 with the creation of the South Dakota Agricultural Experiment Station. 1901 -- Ernest Lawrence (Lawrence Berkeley National Laboratory) was born in Canton, SD. Ernest Lawrence , a Nobel Laureate and namesake of Lawrence Berkeley National Laboratory, was born in Canton, South Dakota. Lawrence, a second generation Norwegian immigrant, received his early education at Canton High School and St. Olaf College. In 1922 he received his B.A. in Chemistry at the University of South Dakota, M.A. in 1923 from the University of Minnesota, and Ph.D. from Yale University in 1925. In 1928 he was appointed Associate Professor of Physics at the University of California, Berkeley, and two years later, at the age of 29, became the youngest professor at Berkeley. In 1936, he became Director of the University's Radiation Laboratory, remaining in these posts until his death. In 1937, Lawrence Berkeley National Laboratory was founded in Berkeley, California. Today the Berkeley Lab is the oldest of the U.S. Department of Energy's National Laboratories. The Lab has an annual operating budget of more than $500 million. In 1939, Lawrence was awarded the Nobel Prize in physics for his invention of the cyclotron, a circular particle accelerator that opened the door to high-energy physics. Lawrence died Aug. 27, 1958 in Palo Alto, California. The first official cases in the South Dakota were reported on September 23, 1918 when the state noted "a few scattered cases." By October 4th, the state was reporting that "cases have appeared in a number of places.” The situation continued to worsen. During the week of November 2nd, there were 218 deaths from influenza across the state. The disease slowly began to decline in the state during the latter part of November. 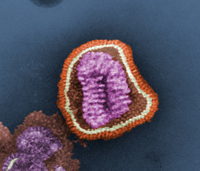 Influenza did not disappear from the state until the late spring of 1919. 1960 -- The North Central Agricultural Research Laboratory was established. In June 1960, the U.S. Congress passed an appropriations bill that included funding for a Federal Insect Laboratory in Brookings South Dakota - known as the Northern Grain Insects Research Laboratory, now the North Central Agricultural Research Laboratory (NCARL). The appropriation, sponsored by the late Karl Mundt, Senator from South Dakota, was in response to continued insect infestation problems faced by grain farmers in the north central region of the U.S. The Mission of the NCARL is to develop, evaluate, and transfer sustainable production and bioprocessing systems that enhance environmental quality and provide profitability for agriculture with emphasis on integrated pest and crop management and agricultural product development. 1996 -- The Sioux Valley Health System (Sanford Health) was founded. In 1996, The Sioux Valley Health System, now known as Sanford Health, was founded. In 2007, the Sioux Valley Health System was renamed Sanford Health in 2007 following Denny Sanford's $400 million gift to the organization. Sanford is former owner of First Premier Bank and Premier Bankcard. 1998 -- Hematech relocated to Sioux Falls. Hematech, co-founded in 1998 by University of Massachusetts researcher Jim Robl, relocated to Sioux Falls. Dr. Robl was the first scientist to clone a cow, and develop procedures to introduce human antibodies into cattle. Hematech later became a subsidiary of the Japanese company Kirin Pharma, which then merged with Kyowa Hakko Kogyo to form KHK. In 2003, Hematech formed a joint venture with Trans Ova Genetics of Sioux Center, Iowa, to manage its animal needs and moved research to Sioux Falls. The Company was acquired by Sanford Frontiers in early 2013 and became Sanford Applied Biosciences. 2006 -- South Dakota Biotech Association was founded. South Dakota Biotech Association is a non-profit organization that is dedicated to developing biotechnology through expanding research, advocacy, funding, education, infrastructure development and promotion. Formed in 2006, South Dakota Biotech serves a membership which includes business, universities, service providers and state-wide economic development entities to expand the bioscience industry. 2014 -- Sanford Health announced $125 million gift to fund genomic initiative for internal medicine.. In Jan. 2014, Sanford Health, announced that Denny Sanford had gifted the organization $125 million to establish Sanford Imagenetics, a first-of-its-kind program in the country that integrates genomic medicine into primary care for adults. Sanford is former owner of First Premier Bank and Premier Bankcard. Sanford Health, formerly the Sioux Valley Health System founded in 1996, is an integrated health system headquartered in Sioux Falls. It is one of the largest health systems in the nation with 43 hospitals and nearly 250 clinics in nine states and three countries. Sanford Health’s 27,000 employees, including 1,400 physicians, make it the largest employer in the Dakotas. Nearly $1 billion in gifts from Sanford have allowed for several initiatives, including global children's clinics, genomic medicine and specialized centers researching cures for type 1 diabetes, breast cancer and other diseases. If you are aware of a notable event or person at your company or organization that should be included in South Dakota Life Science History, please e-mail us at: suggestions@inforesource.org. South Dakota Life Science History(TM) and South Dakota Life Science Evolution(TM) © Info.Resource, Inc.